Wally Kurth was born and raised in Billings, MT, to Sidney and Susie Kurth. The youngest of five children (his siblings are Vicki, Kevin, Sid and Brian), Kurth enjoyed music and acting from an early age. He went on to study musical theater at Loretto Heights College in Denver, CO and eventually enrolled at UCLA, which is renowned for its theater arts program. He received his bachelor’s degree in 1985. After pursuing a career in theater, Kurth ended up on daytime in 1987, playing Justin on DAYS OF OUR LIVES. He continued with his music by creating the band Kurth & Taylor, for which he provides lead vocals and plays guitar. The actor has been married three times. 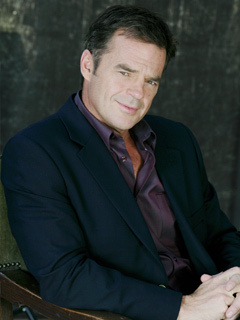 His official Web site is www.wallykurth.net. Previous jobs included horse wrangler, meat packer and telemarketer. He was nominated for Hottest Male Star by Soap Opera Digest in 1996.
Who is The Chattiest Actor In The Makeup Room? What Advice Do You Give To Your Show's Newcomers?